Now that Gus is 18 months old, he is definitely starting to become more and more interested in working with trays and materials on his shelves. After a break to focus on gross motor development, I can tell he is suddenly shifting to coming back to slower activities and more outwardly "purposeful" work. And so, I've continued to prepare the environment accordingly. Our art area is where Henry and Nora spend a lot of time working. Naturally, Gus wants to be there too. So recently, I've revamped the shelves to include 4 new trays just for him. Unlike the older kids, Gus can go gather the materials he wants when doing art. He needs the work organized and ready to go on a tray. It has to be simple or else he is going to be completely overwhelmed, unable to restore the work and less likely to be successful. Each art tray has everything he needs to complete the task, it's then my job to make sure the tray is ready to go again once he has finished. 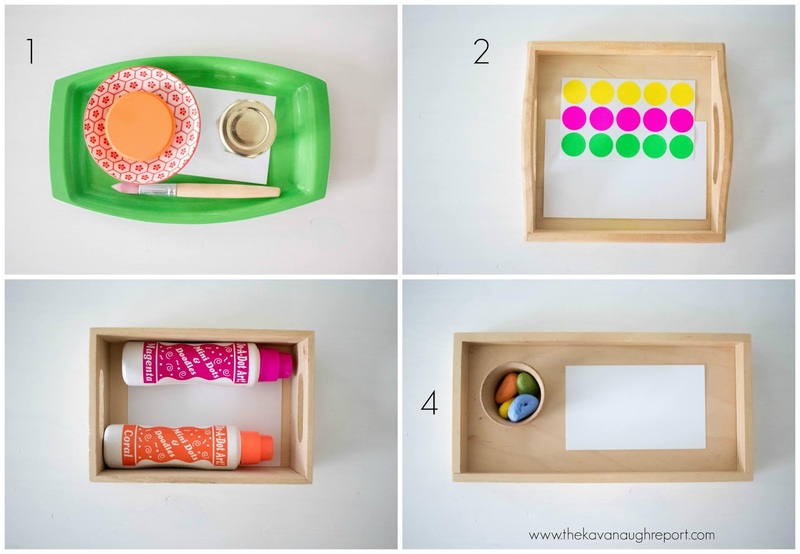 This simple tray is a simple version of watercolor painting. It includes a single watercolor cake, a paint brush, a small container of water, and paper. Eventually, I expect Gus will be able to get his own water, but for now this works really well for him. One color also keeps the mess to a minimum and makes it so he doesn't have to rinse between each choice. 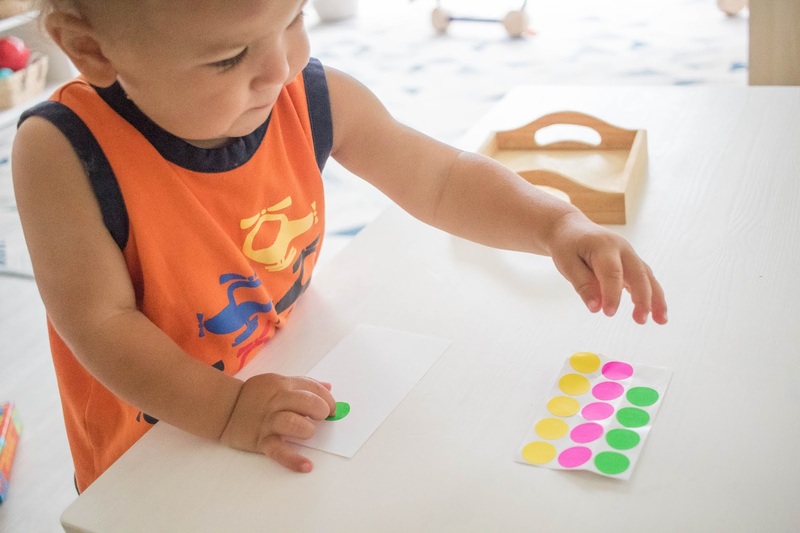 This tray is simply simple stickers and a note card. 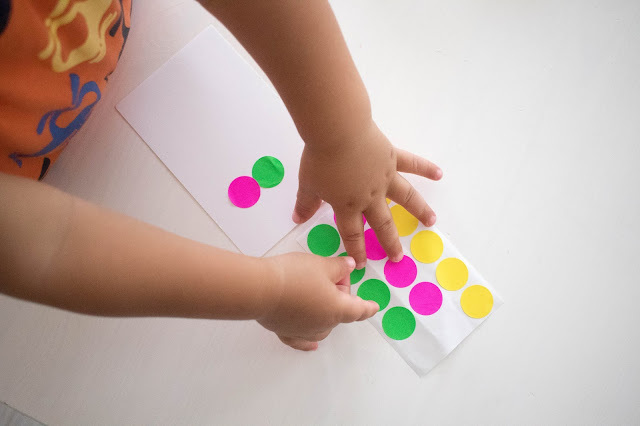 This is such great pincer grasp motion. I love these stickers because while they are a bit of a challenge for Gus, they don't have any edges to get stuck or rip off as he pulls. These dot painters and a note card make up this tray. I make sure not to screw the caps on all the way so that he can do this independently. This is a simple stamping work and very satisfying for him. Again, I include the paper so that this work is ready to go once he chooses it. Much like his first art tray, Gus still enjoys rock crayons. Now, he has a few more choices in the colors. Sometimes I will also switch out his coloring medium to color pencils, or block crayons as well. You'll notice that I chose to use blank 3x5 note cards for the paper. I love these because the paper is a bit thicker and they are all pre-cut. Each fits nicely onto a tray that he is able to successfully carry. I have a small basket of the cards on the shelf, so I can easily add a new card when he has done a work. 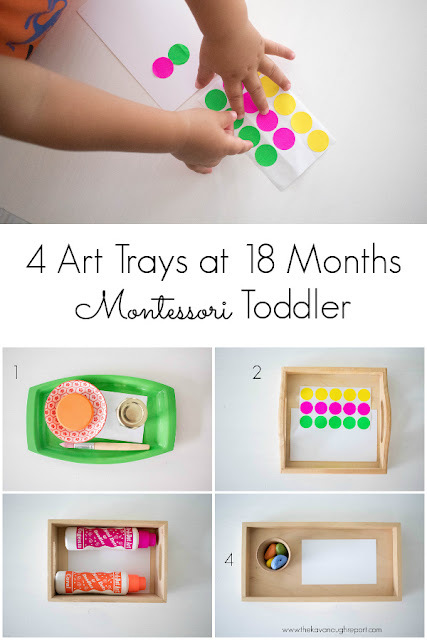 Is your toddler interested in art? What mediums have you tried?